I haven’t shared my favorite things in so long. Usually, I wait until they are a substantial amount before writing them down. But now, I’m ready. I’ve been reading a bit too much crime fiction lately. Sometimes, they get real intense that you just need a witty line or more to contain the heat. 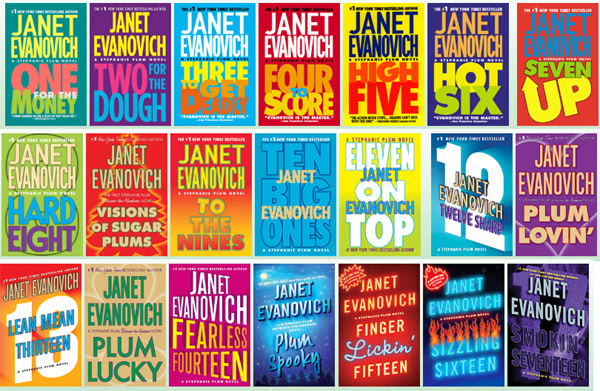 I had read Janet Evanovich before now and she wasn’t half bad so I didn’t hesitate to pick her up once again. This time, I was in for a major surprise. The Stephanie Plum series are 22-full length novels and I stumbled on the 9th. First of all, can I just say it’s incredibly addictive? I’m currently on the 11th novel and I have no plan of stopping. They’re a tie between chic-lit and crime fiction and they serve me just the way I like them – humourous, witty and fast-paced. Elmore is also another crime writer I absolutely cannot get enough of. Just like Janet, he makes crime fiction totally appealing. I’m currently on my third novel. I jumped on podcasts by accident and I haven’t been able to stop. I’m currently bingeing on Elizabeth Gilbert‘s Magic Lessons but I follow a couple of interesting Nigerians on Soundcloud. I’ve also been having ideas of a podcast. Question is, what would I talk about? I’m currently phoneless at the moment but I’ve been enjoying the thrill and duration of Instagram stories from my tablet. I love how I do not have to worry about aesthetics or editing or curation. I also love the spontaneity as it allows me to share bits and pieces of my daily life. I’m forced to look outwards and find beauty in my environment rather than my facial expressions. As a content writer, one of my biggest challenges is aggregating my sources. For a while now, I’ve been jumping from one tool to another and so far, Protopage has been a staple. It is worth mentioning. I’m quite indifferent to a lot of things. Most subjects actually. From politics to economics and sports. TheSkimm has changed all of that. Every morning, I receive bit- sized news in my inbox. Everything that is going on in the world. More efficient than Twitter and CNN. No jokes! I mean that is the only way I’ve been able to follow the Olympics and US Elections. Also, it’s millennial – friendly. Just like TheSkimm keeps me up to date on world issues, Techcabal daily digests keep me informed on the tech scene in Nigeria and Africa as a whole. For the longest time, I kept denying and withdrawing from anything that had to do with tech and its technicalities. My excuse? Too geeky. But now, Techcabal has fixed all that. I mean, if you’re working in an industry, the least you can do is to be informed else you’ll be left behind. Similarly, Quartz Africa keeps me informed on the most important news on politics and economics. I love how concise and easily digestible their articles are. When I’m ready to move to the next level in my career, I’ll probably start from there. This is Isioma and I. We work togther but most times she leaves me to it. Osehmen and her gorgeous son. We get to play with a number of cute babies. I don’t know what I was responding it either. I’ve been sharing a lot of things with my subscribers. Those things I would rather not talk about but need to be addressed and it’s been fun. You can sign up here.